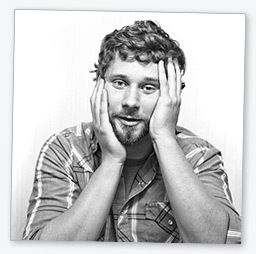 On August 11 of 2009, Dan Mangan released his sophomore album, Nice, Nice, Very Nice in Canada. And it's about time. After three and a half years of touring his sleeper-hit debut, Postcards and Daydreaming, Dan is ready and eager to unveil a collection of lyrical ruminations that showcase his growth as a songwriter. The album immediately shot to #1 on the iTunes Canada Singer/Songwriter Album chart, and #7 at 'Earshot!' College/Co-Op radio (#1 roots category). Rave reviews came from heavy hitting national music-mags such as Exclaim!, CHARTattack and Metro as well as dozens of blogs and local print media. Then came the news that Dan had won �Artist Of The Year� from XM Satellite's Verge Music Awards, beating out acts like Joel Plaskett and Alexisonfire for the top spot � a high profile award with a $25,000 cash-prize. All of this beautifully timed before hitting the road across Canada with his four piece band. Things only got better. Sold out shows became the norm and Mangan graced the covers of three arts/weekly papers while trekking cross-country, meanwhile Nice, Nice, Very Nice hit #1 on CBC Radio 3, XM The Verge and 100.5FM The Peak (Vancouver). Dan performed live in studio on CBC's national programs 'Q' and 'Drive' and found himself the beneficiary of outstanding rave live concert reviews from print and online media alike. Titled in reference to a Kurt Vonnegut poem, Nice, Nice, Very Nice was recorded in Toronto in fall 2008 under the creative eye of producer John Critchley (Elliott Brood, 13 Engines, Leather Uppers). Dropping in to add their talents were such hero Canadian artists as Justin Rutledge, Veda Hille, Mark Berube, Hannah Georgas and members of Elliott Brood, Said The Whale, The Hidden Cameras, Major Maker and Small Sins. What Mangan has to offer isn't overly precious or delicate. He simply writes songs that evoke the wonder and the absurdity in what we do. Mangan has toured Canada, the UK, USA and Australia numerous times. He's played coffee shops to six people and festival stages to many more. He has showcased at Canadian Music Week, South-By-South-West, North-By-North-East, The Great Escape (UK), MusExpo (LA), Big Sound (AUS). Whether alone or with his Vancouver-based band, Dan continues to work all the time. Dan's debut album has kept him on the move with opportunities. Britain's NME magazine featured him as one of Canada's most promising acts. Back home, he has become a darling of the CBC. Gaining respect amid his peers, he has shared stages with Patrick Watson, The Acorn, Elliott Brood, Said The Whale, Great Lake Swimmers, Basia Bulat, Stephen Page, Ohbijou, Arkells, Hey Rosetta!, Geoff Berner, Carolyn Mark, Veda Hille, Mother Mother, and has collaborated with spoken word artists such as Ivan Coyote and the internationally renowned Shane Koyczan. Mangan weaves unique lyrical phrases that simply and subtly unfurl complicated ideas. He delivers them with his signature graveled vocals and understated humour. Somehow, it all just works. Dan stands up and people listen.